This homemade thin and crispy cookies recipe is perfect for any time you?re craving a crispy chocolate chip cookie! This is the recipe for anyone on Team Crispy ? a classic chocolate chip cookie recipe with such alluringly delicious powers that it might just convert chewy chocolate chip cookie lovers too!!! Trick #1: Don?t Use Brown Sugar: It has more moisture than white and is also more acidic, meaning it reacts with baking soda to produce air that helps cookies to rise. Cookie recipes made without brown sugar will be harder, flatter, and crispier. Trick #2: Lower your oven temperature. 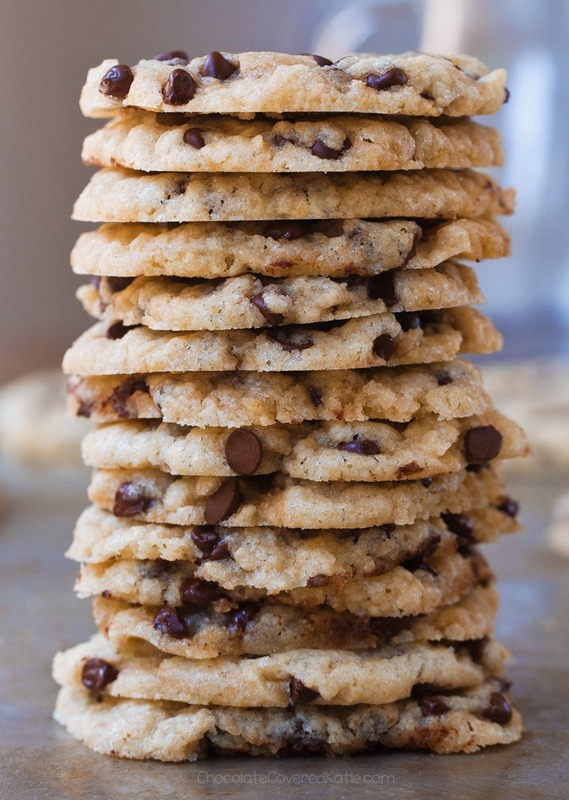 Baking at a lower temperature allows the cookies to spread before rising so they are even and crispy all around. I?ve lowered the oven temperature in this recipe to 310 degrees. Trick #3: No Eggs. If you?re vegan, you?ve already got this one covered! Eggs add structure and moisture to a recipe, which will detract from the crispiness of the finished cookie. Leave them out for the perfect crunchy chocolate chip cookies.